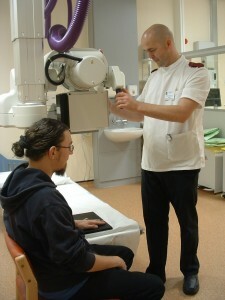 Barnsley Hospital’s medical imaging department is now among the most modern in the country. More than £8.9 million has been invested in the latest equipment and creating a contemporary and comfortable environment for patients and staff meaning our department is now 30 per cent bigger than before including four modern ultrasound rooms and a new CT department. We have one of the most modern MRI scanners on the market – the Siemens Avanto – and specialised imaging software (Tim) to give us better quality and faster performance. The equipment means we can do more than the average MRI unit. On top of routine work, it means we can perform extremely accurate angiography and liver imaging, use diffusion imaging to detect early strokes and help diagnose patients with multiple sclerosis as well as provide a seamless service for immobile patients. It also means we can produce higher resolution images of the body in a much faster time that most scanners. Partnership is at the core of how we work. Our medical imaging team not only work closely with each other, but they also work well versed in collaborations with partners outside the NHS. To add more reporting capacity, we teamed up with Telemedicine Clinic in Barcelona to create the UK’s first partnership where the NHS x-rays and scans are electronically sent to and examined by qualified doctors overseas. We have three trained specialist MRI radiographers fully supported by specialist teams and dedicated administration staff and we’re certain the department will continue to attract high-calibre personnel. We make no compromise on the quality of the work. Partnerships give us the opportunity to work together to deliver the high standards our patients, GPs and commissioners expect. Through close working and within national contract terms, we are able to develop governance arrangements with guarantee the continued delivery of high standards. With a track record of listening and adapting to feedback, we’re keen to continue to perform well in this area by listening and responding to the needs of our GPs and their patients. It goes back to our belief that successful outcomes depend on working in partnership. We welcome your thoughts, feedback and ideas.